Russian virtuoso Lev Vinocour tells us in his own liner note that he received tuition from Mikhail Pletnev while a pupil of Lev Vlassenko at the Moscow Conservatoire. 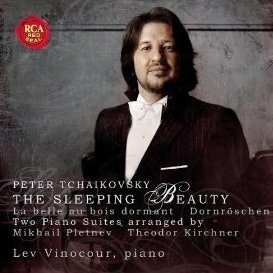 At the time he heard Pletnev perform some of his arrangements of numbers from The Sleeping Beauty, and Vinocour records the whole Concert Suite here, alongside a selection of altogether more modest arrangements from the same ballet by Theodor Kirchner (1823-1903). To provide a suitably rousing conclusion, Vinocour plays his own arrangement of the 'Apotheosis', after Franz Liszt. This makes for a well filled disc of just short of seventy minutes. However, while Vinocour makes claims that he is sticking to the '"Objective" edition of the [Pletnev] suite', his playing strikes me as far more subjective and romantically indulgent than Pletnev's own recording. There's no doubting the younger pianist's impressive virtuosity, captured in full but clear sound by RCA's engineers, and it's great to see Pletnev's wonderful arrangements entering into the repertoire (Simon Trpčeski also included the Nutcracker 'Concerto-Suite' in his EMI debut recital, for example) but comparisons are unavoidable. This is especially true here since Pletnev's own recording of Sleeping Beauty suite has rarely been out of the catalogue, and is now at super-budget price on Virgin. Vinocour can sound heavy-handed in comparison, both in terms of his technique and view of the work. He lacks Pletnev's understated and mercurial way with this music and can sound comparatively laboured. In the Prologue – which takes Vinocour 8'35, almost two and half minutes longer than Pletnev – the opening is brash and percussive and later he is too free with the tempo, losing sight of the piece's balletic origins, happy to let the ending of the movement doze off in a haze of Lisztian colours. The Andante is on the slow side while the Adagio – taking a good minute and a half longer than Pletnev – comes across as unsuitably indulgent: the big rhetorical gestures of the transcription need to be kept on a tighter rein than this to avoid sounding over-blown and vulgar. Vinocour is more successful in the character dances, displaying again a technique that's fully up to the challenges of these arrangements. Nevertheless, his dexterity in the 'Danse des Pages' compares unfavourably with his older contemporary, who consistently outshines him in the humour and lightness of his playing. It's perhaps unfair to make these comparisons and no such observations can be made with the second half of the disc, arrangements of several other numbers from the ballet by Theodor Kirchner (1823-1903), in which Vinocour tells us he detects 'Schumann's subliminal influence'. There's no doubt a definite aesthetic shift from Pletnev's flamboyant yet faithful renderings to the more understated world of Kirchner, who gives us several of the ballet's more reflective passages. We have the first act's Waltz, the magical 'Panorama' from Act Two (designated 'Boat trip to the castle' here) and the 'Scene dansante' from the Prologue ('The gifts of the fairies). We also have some of the fairy-tale based Pas de caractère and the historicist 'Sarabande'. While Vinocour's playing is again full of poetry, Kirchner's arrangements work far less effectively than Pletnev's. Not only are the arrangements less ingeniously done, but the numbers that are chosen simply translate less successfully to the piano. Rachmaninoff struggled to capture the ethereal beauty of the 'Panorama' when he arranged some numbers from the ballet for piano duet, so it's not surprising that here too Kirchner's misses the magic. The Waltz ends up strangely anonymous and, obviously, the masterful touches of orchestration that spice up the character dances are lost – although the remarkable, angular writing of Tom-Thumb sounds even more modern on the piano. Vinocour also struggles to translate the 'Apotheosis' to the keyboard without it sounding bombastic. There's no doubt some impressive piano playing on this disc but I'm not sure how well the mixing of two different styles of arrangement work. Personally, I'd rather stick with Pletnev's own recording of his Suite and, if I need more, turn to the full ballet in its unadulterated orchestral guise.